Tom and I got married in a court house. I was 19. Pregnant. Wearing black. I was never one of those kids who dreamed about what her wedding would be like. I didn't walk around with a pillowcase on my head and pretend it was my veil. So it didn't bother me that I was married in a court house. Now, at our ten year anniversary, I wore white. I had a proper wedding dress. 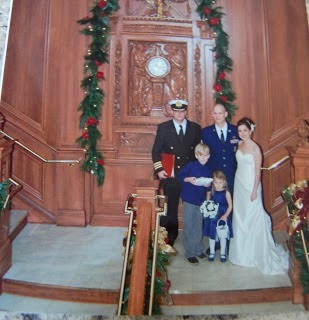 I renewed my vows on the Grand Staircase of the (obviously fake) Titanic in Branson. But again. It was small. Simple. 1. I couldn't care less about colors. Apparently when you plan a wedding you need to have a color scheme. Why? Does it matter what color the tablecloth is? So long as it's clean, it can be neon green for all I care. I cannot get myself excited over colors. 2. I don't care about a theme. Some people have a beach theme. Others have a Mardi Gras theme. If people asked what my theme was I'd be all, "Um, getting married? Isn't that the point of all of this?" I'm not one of those giggly women that would gasp, "My theme is LOVE and HEARTS!" I'd want to slap myself. 3. I'd get insulted if someone didn't like the food at my wedding. The main reason for a wedding is to watch a couple exchange vows, is it not? So if someone is all, "I didn't like the chicken," I'd be all, "Well, you know, stop someplace on your way home from my wedding and pick up your own meal then." I love food but I wouldn't complain if my steak was dry at at wedding. 4. Centerpieces. Most of the time they're too large and they block your view from the people across from you. So you're twisting to and fro, probably knocking into the person beside you as this awful thing with orchids or colored stones rises in front of your face. You cannot make conversation with the people across from you easily. I wouldn't bother with centerpieces. Who really CARES about centerpieces? 5. Honestly, I'd probably just have a giant dessert area and say screw the meal. Don't people want a cupcake or a giant piece of pie anyway? 7. The first dance. Again, going with the number above, I don't like being the center of attention. And also, I don't dance. Yes we could slow dance, but I'd find some way to trip and fall on my face. 8. I'd actually want to keep my bouquet and not throw it. I'd also blush like mad when Tom removed my garter. I'd probably fart from being so nervous. It would just turn into this awful thing. 9. It would bother me that guests would expect food at cocktail hour. Wouldn't I be serving food at the reception? Why do I have to keep feeding people? 10. I probably wouldn't have the something blue, something new, and something borrowed. I didn't at my court house wedding. I might have had it at my vow renewal but only because my friends and family got that stuff. Small details like that simply don't pop into my mind. 11. There's no way I could spend more than $500 on a wedding dress. My first one (the black one) was about $40. The one I wore at the vow renewal was around $300, and my parents treated me to that. I imagine they're thankful I didn't have a large wedding as well, because normally the bride's parents foot that bill. I already told Natalie we're not paying more than $500 for her wedding so if she wants a bigger one, she better save. I cannot fathom dropping a huge chunk on one day, and let's be honest, the divorce rate is high. Some people love throwing big weddings. That's okay. I'd enjoy GOING to a big wedding when I'm not paying for it. I just personally couldn't have one. So did you have a big wedding? Or was it small? I love that you posted this because in my post today, I talked about how I was so nervous at my wedding that I didn't have fun. And I want a do-over! With or without boogers and farts, but hopefully without. And with kids this time! I'm like you - I don't like being the center of attention. I mean..people..I'm a photographer. Not a model. And why do you have to keep feeding/drinking the masses? I don't even eat the cocktail hour because if I do, dinner is ruined for me. Oh my gosh Tamara, I'm so happy to find someone else who didn't have fun at their wedding because they were too nervous! I was the exact same way, unfortunately. I love this! I am not married but most of my friends did the big weddings and I have decided that IF we get married, its going to be a low key, sorta surprise, New Years Eve Party. This New Years eve we did nothing and it made me sad, so I said with everyone having kids and stuff, we'll have an evening wedding at the hall followed by DJ, dancing and midnight lunch. Done! Thank goodness I'm not the only one! With my sister's big wedding coming up in August my family has started asking when James and I are planning on getting married now. Personally, I'd be happy out a campground getting married in jeans, but that has thrown my sister's into a complete tizzy because "that's not a wedding!" I just don't get the whole point of stressing yourself out and spending a ton of money. It's about wanting to be with that person, not about how much you spend to impress others. I've been married twice (both times to the same man - LONG story) and we eloped both times. I really think he would have preferred a bigger wedding but he gave in to my desire to NEVER, EVER be the center of attention. The first time we used the money that would have been used on the wedding to go on a vacation. The second time we used the money to make a down payment on a house. The practical side of me could just never see shelling out those big bucks for an event that I would have hated every minute of. I had a small wedding too, but that's because I was 19 and poor. Ha! I would love to renew our vows (we're coming up on 14 years)and have a better one this time around. I had a large wedding. I understand not having a large wedding, but for me I never saw another option. Both my husband and myself have large families. We wanted to have an event where everyone we love was there to enjoy the day with us. I know it's not for everyone, but that was why we did it. However, I did NOT do a bouquet and garter toss. I felt absolutely no need to do it. You look beautiful in both you black and white dress. A wedding is so personal, you have to have the wedding you want. Have you been watching The Four Weddings on TLC? You hit all the point categories from that show, LOL! I am with you though. I don't want a wedding. I honestly don't. I never dreamt about a wedding. I never even knew I was supposed to? I just thought Id be married, have children, have a house to clean. I never thought about how I would get those things, ha. Which would explain why I am single as a single lone branch on a tree, with no prospects. And even if I did, I'd just want to elope or do the courthouse thing. Get it over with, and start life together as if it was always that way. i had a decent sized wedding (i paid for it out of my own pocket, minus the 600 my in laws gave me for the cake-which the cake was 200, but shh dont tell them). the color was apple red. and you know what, if i could go back in time i would have never done it that way. i was really nervous about everything coming together and there was drama between my bridesmaids (friends vs cousins). but i didnt have a theme, my theme was "wedding" LOL. We had a fairly small wedding which was perfect. If I had to do it again I would save the money from the wedding and go to Hawaii instead!!! I don't want to have a huge wedding, mainly because it is freaking expensive and it is so much more stressful. 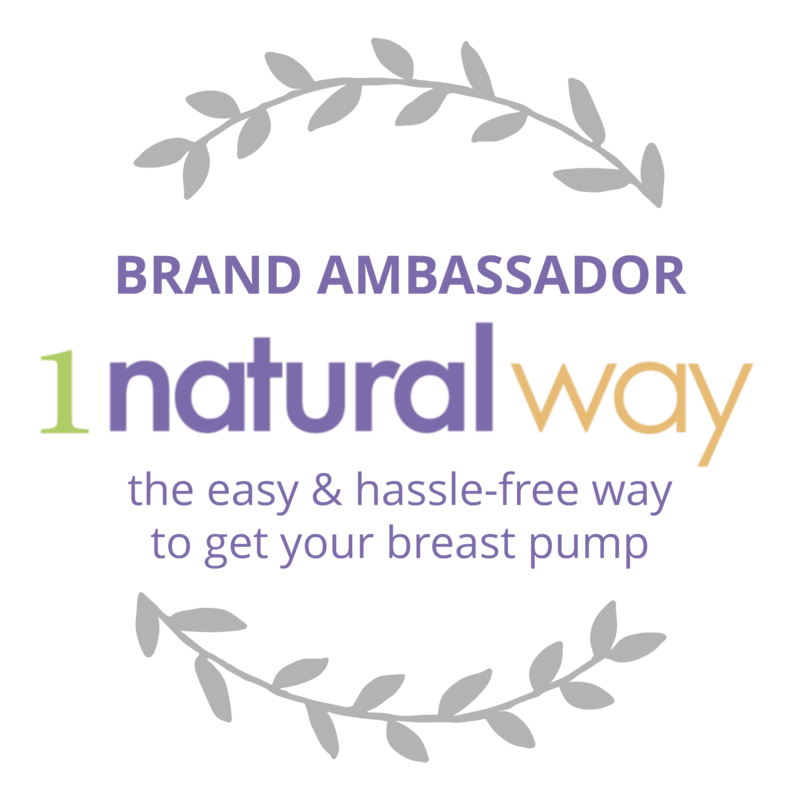 John and I want to keep it simple, and do as much as we can ourselves to save money. Like for food at the reception we are going to have a potluck type theme :) I also don't want to invite everyone and their mother's brother's sister-in-law's grandparents. Just close family and friends that mean a lot to us. When my boyfriend and I get married, we don't want anything fussy and overwhelming either. Give me a backyard BBQ and just a few friends! My boyfriend said if we ever get married, he wants a small wedding. While I want a huge, expensive one. We'll probably end up meeting somewhere in the middle. Which I think I'd be okay with. After all, less money for the wedding equals more money for the honeymoon! we had a pretty big wedding but that's because my family is so huge. if it were up to me, i'd be a small wedding at an adorable bed and breakfast! I'm not sure how you would quantify the size of our wedding, but we invited all the people we wanted to. The music, food, DJing, photography, and flowers were all done by family friends. It was nice being surrounded by all those people who love us. Plus ours was in the afternoon. There's no way I could have waited all day long to get married. I would have been a basket case!! I currently work with college students who all seem to be planning their weddings. It drives me a little bit CRAZY!! I got married in a JOP's house, wearing a red Chinese dress I paid $20 for in Chinatown and I was 5 months pregnant. We ate at Chili's afterwards. But it was so much fun and we were so in love and so glad to be together. I wouldn't mind a vow renewal one day. But I like what you did, sort of a low key thing that you did together without tons of people. I'm not married but it kinda gets me excited thinking about planning a wedding and I'm a regular at bhldn.com <3 A girl can dream! I should probably get a fiance first, though. Big weddings just seem like a lot of work. If it'S your dream, that's great, but it's not for me, which is good, because no one has asked me yet! Big weddings are so beautiful but so not me. I married my husband in his (our) home with his daughter standing on one side of him and our preacher standing in front of us. Just us 3. No parents. No friends. Just my new little family. The thought of planning a wedding makes me cringe for MANY of these reasons!!!!! They're so much damn MONEY! Even "cheap" ones are expensive in my eyes! She could get married at Disney World and wear a Princess dress! My first wedding was in a hair salon it was in her house and her husband was a preacher. I was wearing a black hoodie. My second was a small ceremony in the backyard. I love the wedding shows but I think most of the stuff is insane and could never actually spend that much money on 1 day. I didn't have a weeding when I married my husband, but I do DREAM of renewing our vows somedays. I want to run away somewhere on a beach with just our very closest family (I'd be fine if it was just us and our kids). No reception, just some sand, some vows, and the people most important to me! I think I'd probably like going to a big fancy wedding--but I did NOT want one. I did have a wedding--but it was the "in my grandparent's church because the venue was free, nachos and cake in the church basement as a mid-afternoon reception." No dancing and no alcohol because the church didn't allow it, which was fine with me because....I just wanted marry my man, that's really all I wanted out of the day. And I got it! My first wedding was a bigish wedding and honestly, it was a lot of work, money, and drama. And like you, I never dreamed of getting married. This time around will be much, much smaller and for just myself and my fiance. My husband and I eloped. I've never regretted it. Not once. Not even when my MIL wanted us to repeat our vows in the catholic church. I don't like being the center of attention and feel the entire wedding extravaganza is such a rip-off. There is so much more to a marriage than the wedding day. I've had three weddings, so I have some experience here, lol. But none of them were the huge, lavish affairs you see on tv. The first was a church wedding with a reception at my parents' house. The second was a backyard wedding. The third we eloped, got married on the beach with 2 friends as witnesses. BY FAR that one was the best!!! We had a smallish wedding (just under 50 people counting us), but I still had all the normal wedding things. Theme, colors, amazing meal. I always dreamed of my wedding, but I liked that everyone there was important to us and not invited just because. That Titanic location looks really cool. What a great place to renew your vows. We had a fairly small wedding and I didn't even have a wedding party. oops. I did have to wear the white dress though, because it was the one day I was going to. We had a teeny wedding too, and I'm so glad. It was stressful enough as is, mostly because of in-law issues, so I'm glad we didn't have more people causing a riot at a large event. Plus, I hate the thought of wasting so much money on a wedding! Why not put it toward something else you want as a couple? In the end, it's all about the marriage, not the wedding (aka Big expensive party). I totally agree with you! I would rather save the money! I had a small and modest budget for my wedding and it was the best day of my life. True, Maturity can change our choices in life! This is great and very helpful to those who are preparing for a wedding! When it comes to weddings, go with what you want. One of my daughters had a huge wedding (over 250 guests), another had a plantation outdoor affair. The youngest one got married on a yacht while circling the Charleston harbor. Her wedding was the smallest (100 guests) and I enjoyed it more. It was not stuffy and formal and all that stuff. Guests still talk about that wedding being their favorite ever. My husband and I got married in Vegas. We had one of his brothers there, but that was it. just us and I love that we didn't spend a fortune on a big wedding. We didn't have a big wedding either. 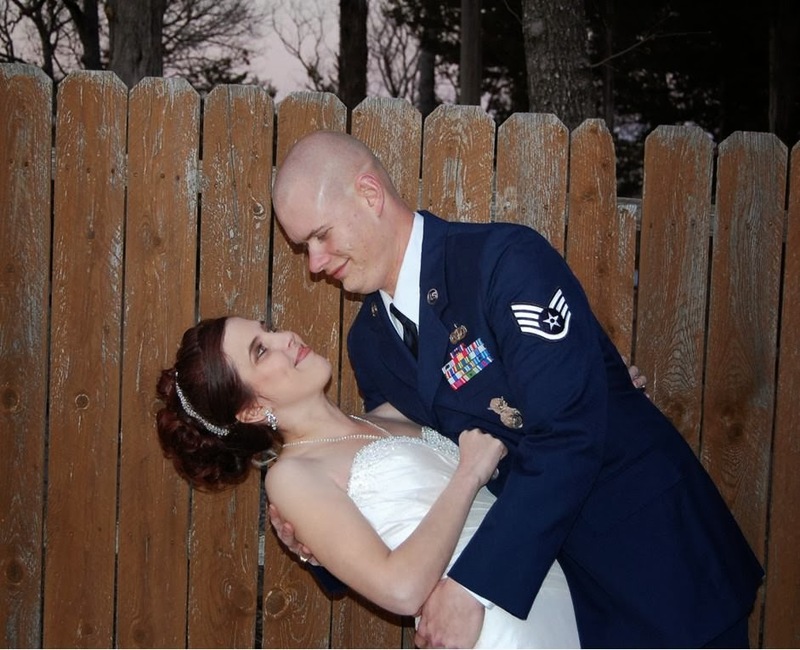 My husband looked so handsome in his Air Force Uniform. Around here where I live big weddings are not the norm. You totally crack me up! I did have a regular wedding but I kept it pretty small! I totally agree with you on a lot of these cons. I was never much of a girly girl. Even the rehearsal dinner all we had was pizza in the basement of the church. I loved it. Your number 11 would be my number one, for sure. While I recognize the significance of a wedding, I'm not all that interested in spending HUGE sums of money for it. We can use that money to buy a house, invest, buy a car, prepare for the family, or a list full of other things. I think you did the right thing for you. Congratulations! I always love reading your posts! Big weddings can be overrated, and I say this as someone who had a big wedding! LOL. In hindsight, I wish I would have funneled that money into an extended honeymoon, or a down payment on a house. Your 10 year anniversary photos are lovely, and your wedding gown was beautiful! I couldn't agree more. We had a very small wedding and I wouldn't have changed a thing. I also don't like being the center of attention. I also think as a society, we should place more emphasis on the marriage and less on the one-day wedding. I had a decent sized wedding. At the ceremony I was supposed to have a bagpiper, but he didn't show up...there was no music at the chapel. I had everyone hum as I walked down the aisle. Big weddings definitely aren't for everyone. Kudos to you for writing this post. Too many people spend a ton of money on their weddings because society tells them they have to. We had a small wedding. It was an outdoor wedding and it was perfect for US. Our guest enjoyed themselves and many still say it was one of the nicest outdoor weddings they'd ever attended. If only they knew 1/2 the worries we had prepping for our big day. The joys of planning an outdoor wedding. I too enjoyed my small wedding. It was so much more intimate and personal. Loved it so much. I am not married but if I was ever to get married it would be small - I don't like being centre of attention and to be honest the whole idea of a wedding puts me off getting married. I think it is great you did your wedding your way! My wedding got high jacked by my Mom, Step Mom and Mother in law, they took it over. I showed up and it was a lovely wedding but one that I did not pick much out in. I picked my groom and my dress. 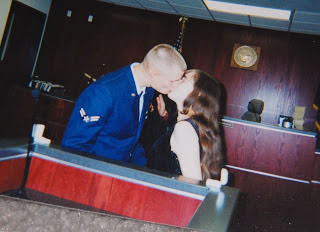 Ten years later our marriage is what matters, not the wedding. I love that you renewed your vows at ten years! We spent like 2 grand on our wedding about 10 years ago and I'm happy with it. It wasn't small or big...it was good enough for some great wedding pictures though. I know couples now who are getting married and will be paying off their wedding for another ten years. I keep thinking...I hope it lasts because of all the money they spent. Wedding costs are so high these days, I don't think anyone wants a big wedding unless they've been saving for it for a long time, lol. I think it's nice that you had a simple ceremony. It's all about just celebrating love. As long as you enjoy your wedding, that's what counts. I didn't do a lot of traditional stuff too but it was so perfect for my husband and me. It's always a great thing to look back and smile -- feel happy about what you've done in the past and be proud of it. I don't comment when I don't like the food in a wedding reception because what's most important is that you're celebrating the occasion together with the couple anyway. Smaller weddings can definitely be less hassle and stress! It's really all about the love between two people anyway. Nice to see you celebrating your 10th anniversary in style, loved the picture. We too preferred a quieter wedding rather than one which is over the top. Me too, doesn't want to have those extravant weddings cakes, fluffy dresses and all those wedding fuss. Getting it done at the city hall is perfect for me, and spend luxury on our honeymoon. Lovely story dear and you made us smile! I love looking at photos of big weddings but I have been in plenty and I think that if I ever do get married one day I want a small wedding. Big weddings just aren't my thing. I think simple weddings are the best. Why spend all of the money and start your married life with an empty bank right? Doesn't make sense to me to spend so much. 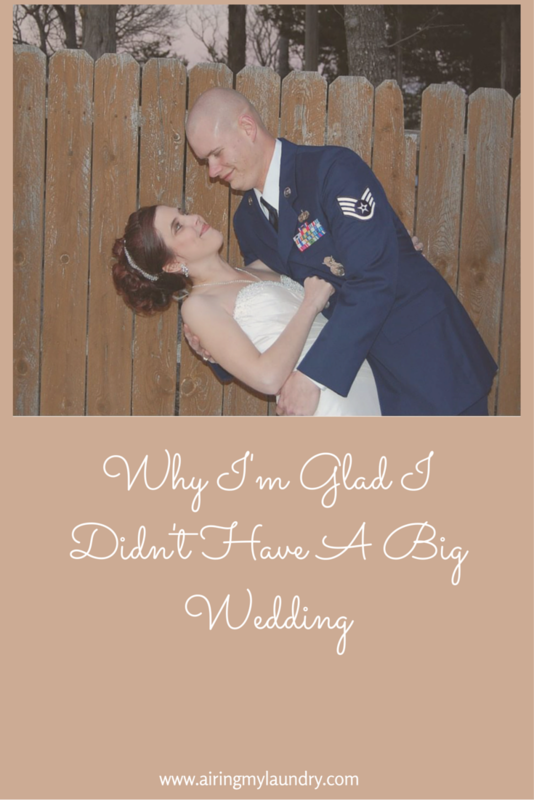 Both my husband and I have large families and there was no way around a big wedding. We all had a blast and would do it all over again if I had to. The wedding celebration is a way to bring both families together, create a beautiful bond and start making memories together. My wedding was small and on the beach. I would have it no other way. I completely agree that big weddings can often be very uncomfortable and anyhow isn't it about showing the person you are marrying how much you love them as opposed to convincing the guests? I would also add that my fear would be that people would not turn up so it would be better to keep it intimate with the people that matter the most. Ours was a small "family only" (and a few close friends) wedding. We wanted to maintain the solemnity of the occasion and not turn it into a carnival of sorts. We saved the money we would have spent on a lavish wedding and used it as a downpayment for our own house instead. I am not married yet but I too don't want a big wedding, just want something small and intimate with a couple of friends and family. It could be at the back of my house for all I care. We had a medium sized wedding and I didn't dream it growing up or think about exactly what I would wear. I think a big wedding just overshadows the whole thing. This is a great article. The older I get the smaller I think I want my wedding. It's a day for you and your loved ones.